Wildfires are currently raging across California and other parts of the western United States. That makes it both an awkward and appropriate time for the release of Only the Brave from director Joseph Kosinski and based on a Ken Nolan GQ article. The story focuses on the Granite Mountain Hotshots, a firefighting crew in Arizona that is determined to prove its worth. One of the county’s elite units, they’re eventually called upon to defend their own hometown from a fire that requires all of their skills, including their belief in depending on the guy next to you, to fight. Josh Brolin stars as the head of the unit, their leader and moral compass, while Miles Teller stars as the new recruit determined to join the team and help the cause. 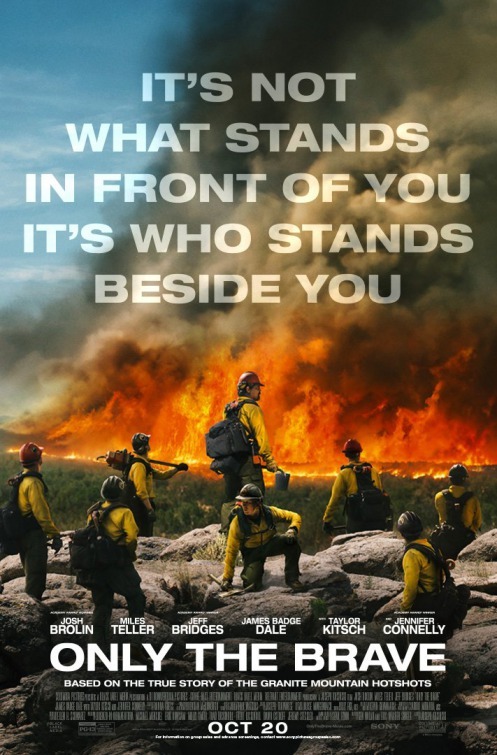 The first poster establishes the stakes of the story – a fire that’s raging in the background – while also communicating the selfless nature of the firefighter, shown here from the back. The cast and the fact that it’s based on a true story are both here as well, but the idea is to cast this as a “man against nature” story. The theatrical poster has a clear message for the audience: “It’s not what stands in front of you, it’s who stands beside you.” That’s in-line with the overall “brotherhood” brand identity that’s been created for the movie. This time the perspective is pulled back to see more of the landscape on fire and show the whole team. While most remain anonymous, the faces of Brolin and Teller can be seen. The stars, including Jeff Bridges and Jennifer Connelly, are much more prominent on an IMAX-specific poster. They, along with a few other members of the team, are shown in profile looking meaningfully off into the distance as the fire burns on the other side of the ridge and aircraft drop fire-suppression liquid. We hear in the trailer about how tough the life on this elite team of firefighters can be as a new recruit seeks to join their ranks. They’re all preparing for the day a fire comes ranging down the hills toward their town. That day comes soon enough and they all have to go fight to save the town. It’s clear this is not only a true story but one about highly-skilled individuals in their own band of brothers. That connection, as well as how the job takes them out of the lives of their loved ones, is repeated throughout and reminds me of The Right Stuff quite a bit. It’s good, though it’s certainly familiar-enough territory, making it clear which emotional heartstrings of the audience will be pulled. The second trailer ups the emotional stakes by starting with one of the firefighters actually leaving his wife and small child before heading out on a job. We hear more about how great a team this is. There are lots of scenes of danger as the team faces a massive fire, but they’re shown as cocky and capable in the face of whatever it throws at them. Completely missing here is the story of the newbie, Brendan, that was featured in the first trailer. This is more about the action the team faces as they go up against the fire and the skills they bring to that task. That story is brought back to some extent in the third trailer, but it’s really a side note, while the emphasis is on the quest by Marsh to get his team the certification – and respect – they deserve and need to take on the big fires and really prove their value. It’s all about standing and proving you’re good enough. The movie’s official website opens by playing the most recent trailer. Close that and you get a version of the theatrical key art on a page that includes a button to buy tickets and links to its Facebook and Instagram (no Twitter?) profiles. There’s also, appropriately, a button for people to donate to the Granite Mountain Fund to support the firefighters out there in the forests combatting these kinds of blazes. As the top of the page there’s a menu that will let you watch the “Trailer,” read a synopsis in the “About” section and view a “Gallery” of stills. An IMAX-specific TV spot hits the idea of this being an elite team hard right from the start, showing the kind of danger they willingly walk into. Other than that there doesn’t appear to have been a lot of TV advertising done, perhaps out of sensitivity to how those spots could be shown alongside footage of real fires being fought right now. Online ads used the key art as well as footage from trailer. The same kind of footage was used in Twitter and Facebook promoted posts that links to ticket sales. In one of the first bits of publicity for the film Brolin talked about the dedication and commitment of both the real-life firefighters the movie is based on but also the bonding the cast did as part of production. Brolin and Taylor Kitsch appeared at a Washington NFL Team game as part of a ceremony honoring firefighters. Some of the cast also traveled to Phoenix to do similarly. The same two mentioned above took part in one of those Wired things where they talk about the most common searches for each other’s names. Teller showed up on “The Tonight Show” to talk about some of his recent movies and the serious issues behind them, including this one. There was also a profile of Kitsch where he shared a story of meeting the family of the man he plays and the intensity of some of his other recent roles. In general the campaign wants the audience to latch on to the message of brotherhood and valor, and rightfully so. There’s a lot of that on display and it’s something that usually works, getting everyone invested in the fates of these men who have put their own survival in the hands of those around them. That’s the strongest element of the campaign. What’s less effective is the way Teller in particular seems to come and go from the campaign randomly. It’s not a huge problem, but when you look at the effort as a whole it’s noticeable. Perhaps someone decided to keep the focus pulled back on the whole team but then remembered they hired a well-known actor and so had to spotlight him. Whatever the reason, it’s odd. It doesn’t detract from the emotion of the entire campaign, though. While there have been a few efforts to address the reality of the story being told and nod to the current tragedy in California and elsewhere, it remains to be seen if there’s any sort of appetite to go see a story that appears all too close to what’s seen in the news. That could be a big factor in determining the movie’s box-office success. Content Strategist. I like that name.